New York: A gauge of global stocks fell for a third consecutive day on Friday amid uncertainty about global economic growth and trade tensions, posting its first weekly drop this year, while the US dollar tallied its strongest week since August. MSCI’s gauge of stocks across the globe shed 0.35 per cent on the day, and dropped for the week following six consecutive weekly increases. Still, Wall Street’s main equity indexes rallied late in the day on Friday, with the benchmark S&P 500 ending marginally positive. President Donald Trump said he did not plan to meet with Chinese President Xi Jinping before a March 1 deadline to achieve a trade deal. “Right now, the focus really is on China,” said Mark Otto, global markets commentator for GTS in New York. “The market doesn’t like uncertainty, and it seems to be in abundance at this particular time.” The Dow Jones Industrial Average fell 63.27 points, or 0.25 per cent, to 25,106.26, the S&P 500 gained 1.83 points, or 0.07 per cent, to 2,707.88 and the Nasdaq Composite added 9.85 points, or 0.14 per cent, to 7,298.20. The sentiment continues to be investor anxiety about US-China trade relations, the slowing global growth, and I think this week what is starting to really creep into investors’ anxiety is around corporate earnings” said Michael Arone, chief investment strategist at State Street Global Advisors in Boston. 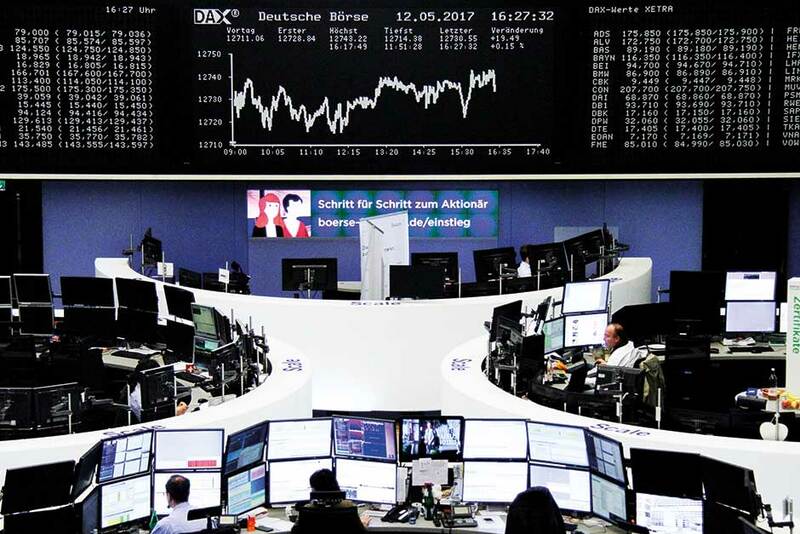 The pan-European STOXX 600 index lost 0.56 per cent. The dollar index rose 0.13 per cent, with the euro down 0.17 per cent to $1.1321. US Treasury yields fell for a fourth straight session. Benchmark US 10-year notes last rose 6/32 in price to yield 2.6339 per cent, from 2.654 per cent late on Thursday. US crude settled up 0.2 per cent at $52.72 per barrel and Brent settled at $62.10, up 0.8 per cent.